This webinar will reveal how smart metrics are helping B2B organisations to systematically attract, engage, qualify and convert more of the right sort of prospects. Drawing on the winning habits of many of today’s top-performing sales and marketing organisations, we will show how the proactive management of the lead-to-revenue process is shortening sales cycles, increasing win rates and improving the return on marketing resources. The webinar will explore the importance of crystal-clear pipeline definitions and milestones and the need to measure velocity and conversion rates at each stage in the process, as well as explaining why sales and marketing must adopt a common language in addition to sharing consistent goals, measures and metrics. Listeners will be left with immediately actionable recommendations to improve their marketing and sales performance. 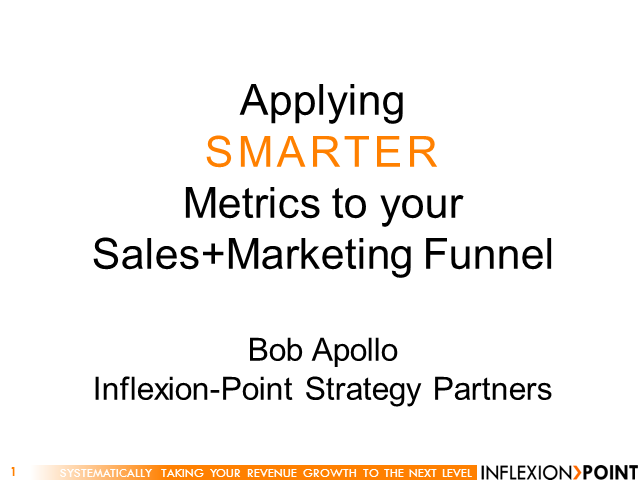 PROFILE: Bob Apollo is Managing Partner of Inflexion-Point, the UK-based sales and marketing performance improvement specialists. He helps ambitious growth-phase B2B companies to systematically attract, engage, qualify and convert more of the right sort of prospects. Prior to founding Inflexion-Point, Bob worked with and for high-growth B2B companies in sales and marketing leadership positions - many of which emerged as leaders in their chosen markets, including HP, Sybase, Vodafone, Sterling Commerce, SCO and the Protege Group. Bob writes regularly on B2B sales and marketing issues at www.inflexion-point.com/blog, has been named a "Top 25 Sales Influencer for 2012" by OpenView labs, and is a featured contributor to Entrepreneur Country, CustomerThink and a range of other publications.